What better way to start the new year than by getting yourself a free download of Avril Lavigne’s brand new single ‘What The Hell’!? As you’ll no doubt be aware by now, ‘What The Hell’ is the first tune to be lifted from the singer’s long-awaited new LP ‘Goodbye Lullaby’ which is slated to drop in early March. The single is also serviced officially to Aussie radio tomorrow afternoon at 4pm. Canny radio stations, however, will no doubt do exactly what you’re about to do and download the track free. 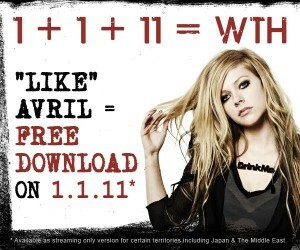 But here’s the deal… To get the track, you’ve got to ‘Like’ Avril Lavigne on Facebook. And the free download will only be available for 48 hours. Best get your skates on then. Head HERE to ‘Like’ away! ‘Goodbye Lullaby’ is ready to hit Aussie retail on Friday March 04.